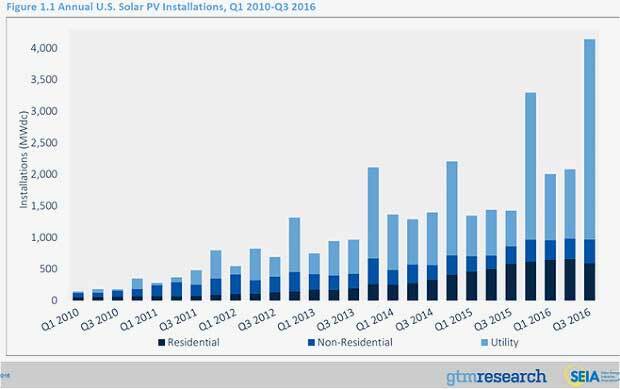 The United States solar market just shattered all previous quarterly solar photovoltaic (PV) installation records. According to GTM Research and the Solar Energy Industries Association’s (SEIA) Q4 2016 U.S. Solar Market Insight report , 4,143 megawatts (MW) of solar PV were installed in the U.S. in the third quarter of the year, a rate of one MW every 32 minutes. That pace is even faster today, as the fourth quarter will surpass this past quarter’s historic total. The report points to an “unprecedented rate of project completion” in the utility-scale segment as a key growth driver. In fact, the utility-scale segment represented 77 percent of solar PV installed in the third quarter of the year. GTM Research anticipates that a massive 4.8 gigawatts (GW) of utility PV projects will come on-line in the fourth quarter of the year – that’s more than was installed across the entire utility PV segment in all of 2015. • Primarily driven by utility PV, the U.S. installed 4,143 MWdc of solar PV in Q3 2016, increasing 99% over Q2 2016 and 191% over Q3 2015. This marks the largest quarter ever for the U.S. solar industry. • On average, a new megawatt of solar PV capacity came on-line every 32 minutes in Q3 2016. • Between Q1 and Q3 2016, solar accounted for 39% of all new electric generating capacity brought on-line in the U.S, ranking second only to natural gas as the largest source of new capacity additions. • Through Q3 2016, the U.S. solar PV market has already surpassed its record total from 2015, driven by 14 states that installed more than 100 MWdc between Q1 and Q3 2016. • In Q3 2016, California became the first state ever to add more than 1 GWdc of utility PV in a single quarter. • For only the second time in five years, the residential PV market fell quarter-over-quarter, primarily due to a slowdown in major state markets, especially California. • In Q3 2016, community solar added more capacity than the segment installed in all of 2015, playing a key role in supporting the second-largest quarter ever for the non-residential PV market. • GTM Research forecasts that 14.1 GWdc of new PV installations will come on-line in 2016, up 88% over 2015. Utility PV is expected to account for over 70% of that new capacity.